How do you define a thing? For example, if you ask, ‘what is a bus?’, you could start to define that by setting out all the conditions that define a ‘bus’ until you have covered them all, and then you have the necessary and sufficient conditions to answer the question. Often the problem is that you’ll find an example that breaks the definition and you have to re-define the answer. That’s especially true of things that are more nebulous than, say, a bus. Try defining Art, Music, Beauty, Blues, and so on. 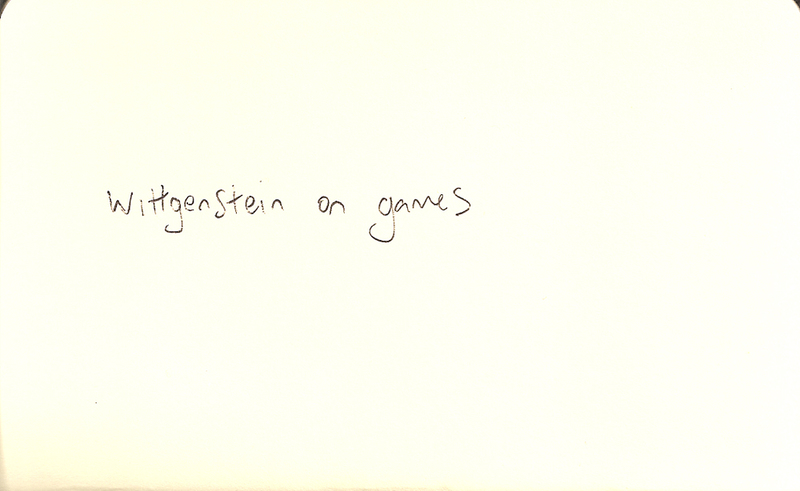 Anyhow, in his book, Philosophical Investigations, Wittgenstein ask the question, ‘What is a game?’. He gets you to think about the nature and use of language, and his argument, briefly, is that words are not defined by the things they represent, but rather by their use. And that there is no need for the idea of a perfect version of a thing to exist independently of an example of a thing. That fits really well with music, I think. You can say, ‘a is a bit like b, which is a bit like c, which is like d’, and so on. And that, ultimately, removes the need for a boundary definition. All music can be connected together into one big amorphous blob of music. And all art. And all creations. And Everything.